Detectives with the Fresno County Sheriff’s Ag Task Force (ATF) have arrested 75 year old Manuel Hernandez of Fresno. He has been booked into the Fresno County Jail for possession of stolen property, as well as outstanding warrants for driving on a suspended license. His bail is set at $11,000. 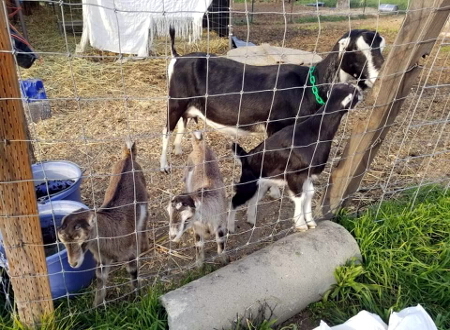 On March 25th, ATF detectives received a tip through Valley Crime Stoppers stating some recently stolen goats were being kept at a ranch located at 1279 W. North Ave. in Fresno. Detectives arrived at the property and found 18 goats in pens. They identified five of them as belonging to members of the Kingsburg 4-H club, which had a March 11th theft report on file with the Sheriff’s Office. The 4-H club has now recovered all nine of its stolen goats, four were found roaming along a road days after being taken. Two of the other goats on this property were determined to belong to another person who had filed a theft report with the Sheriff’s Office. All seven goats were returned to their respective owners. It has not been determined whether or not the remaining 11 goats were stolen. However, as a safety precaution, detectives transported those goats to a boarding facility to allow extra time to try and track down their potential owners. If you are a citizen who had your goats stolen and would like to see if any of the 11 goats might be yours, please contact the Ag Task Force right away. Detectives assigned to the Ag Task Force continue their investigation into this series of goat thefts. From January 9, 2019 – March 11, 2019, there have been nine different reports of goats being stolen. A total of 70 goats, totaling $28,000 in losses, have gone missing from different private properties in the area between Easton and Riverdale. Ag Task Force detectives are also working with investigators in Kings and Tulare counties to try and generate leads in these cases. As of March 26th, seven cases remain open with 59 goats outstanding. Detectives offer these tips to help protect your livestock. Make sure your fencing and gates are secure. Stay vigilant by watching your property for suspicious activity. Spread the word to neighbors and friends to do the same. Consider locking up animals during the night. Invest in trail cameras, which could capture images of suspicious vehicles and license plates. Monitor websites where buying and selling take place. Attend auction yards to view animals being sold. If your animals appear to be on the grounds, notify the auctioneer immediately to delay a sale. Report any theft of livestock to local law enforcement right away. Anyone with information on cases of goat theft is ask to contact the Ag Task Force at (559) 600-8150, Crime Stoppers at (559) 498-7867 or www.valleycrimestoppers.org You will remain anonymous and may receive a cash reward.